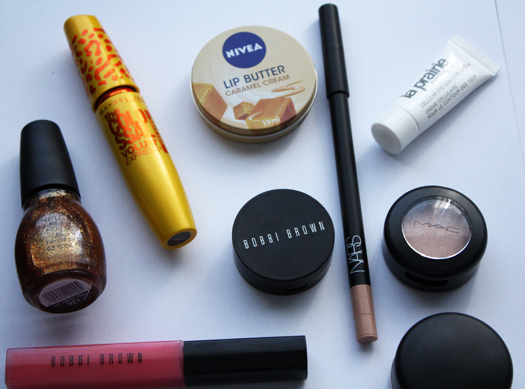 ♥ Bobbi Brown Lipgloss in Pretty in Pink-Part of my nzgirl #bloggersclub prize pack. This gloss is a sheer pink lemonade colour. It isn't shimmery either, just glossy which I like for a day to day colour. I love the staying power of this gloss and the fact that it isn't sticky at all. It also feels nourishing rather than drying on the lips which is another bonus. It does have a slightly minty scent which I'm not a fan of but it soon fades after the gloss is applied. ♥ NARS Larger Than Life Long-Wear eyeliner pencil in Rue Bonaparte. I have a problem with regular eye pencils in that I somehow end up smashing the lids and in turn the pencil. After that happened one too many times I found myself needing another flesh toned liner. NARS eye pencils get a lot of love in the beauty world so I bought this one. Thanks to the creamy formulation this pencil glides across the waterline like a dream. It is also super pigmented and lasts virtually all day once applied. 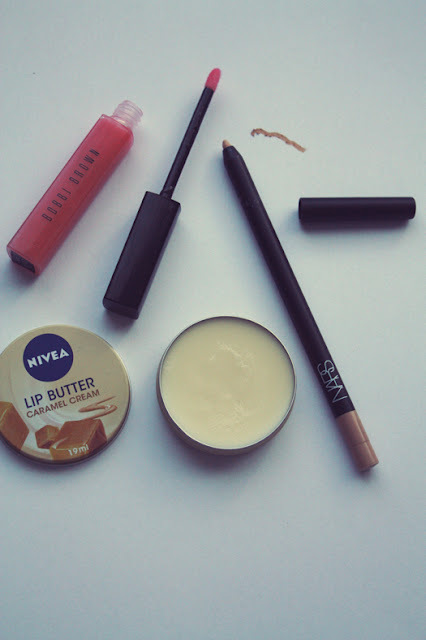 ♥ Nivea Lip Butter in Caramel Cream. * Lip butters are having their time to shine in the beauty world right now and with offerings like this one it's easy to see why. This lip butter smells amazing, applies smoothly & leaves lips hydrated and smooth. Read my review here. ♥ Sinful Colours Professional nail polish in All About You-A gift from Maria & Isabella of Avenue M & Views of Now. I went through a big nail polish phase a few years ago but I don't buy it very often nowadays seeing as I get my nails done, so it's always a treat when someone gives me polish. This colour is so beautiful on. I applied a thin coat over Essie's Sugar Daddy and it looked lovely. It is easier to remove than some other glitter polishes and doesn't have the grittiness either. ♥ La Prairie Cellular Eye Contour Cream. This was fished out of my bag of samples this month and I think it was in one of those travel packs they hand out on planes. Admittedly I tend to fall in love with every eye cream I use but this one stands out to me. It reduces the appearance of dark circles like nothing else and the under-eye area is extremely moisturised in the process. On a side note, does anybody know if La Prairie is available in New Zealand? I want to get the full size of this so if anyone knows leave a comment. 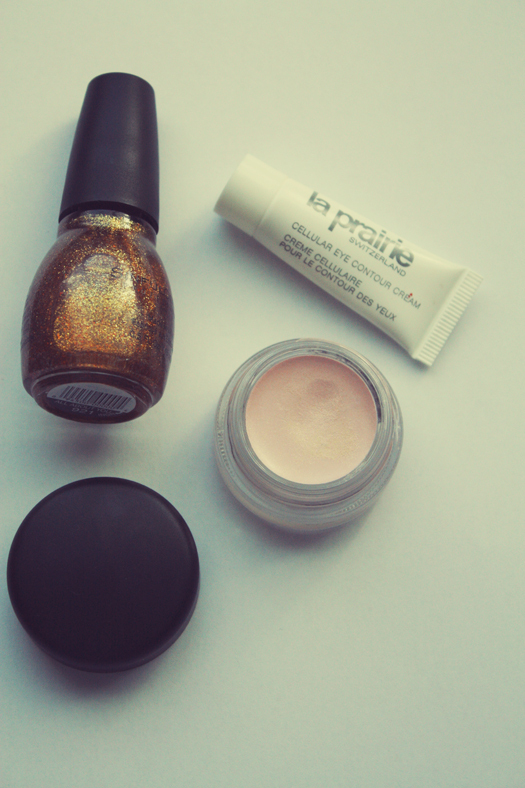 ♥ MAC Pro Longwear Paint Pot in Let's Skate. I saw. I swatched. I inevitably fell in love with this beauty. The colour itself is a baby pink with flecks of fine gold shimmer throughout. It looks lovely by itself or paired with other shadows to give them a bit of something-something. It also keeps my shadow from creasing faster than it usually does, which earns it metaphorical gold stars. ♥ Maybelline The Colossal Volum Express 'Cat Eye' Mascara. * This is the first Maybelline mascara I have ever owned and I was pretty impressed by it. This mascara is great for daytime looks if you want your makeup to look more natural. Lashes are nicely lengthened and curled without looking too full on. The wand does curve inwards on one side (see above) which I did find a bit unusual but I used this to wing out the lashes on the outer corner of my eyes. 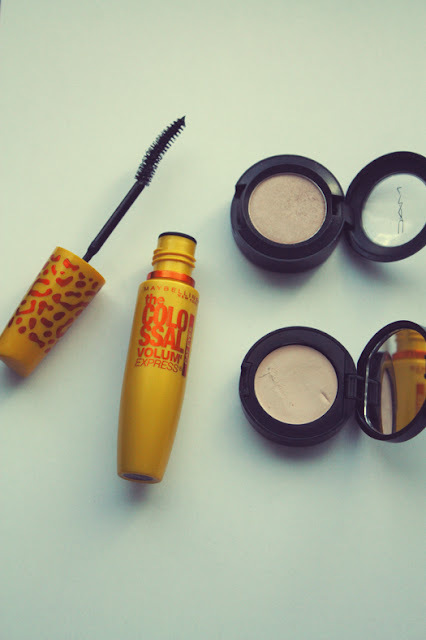 I really want to try their 'The Falsies' mascara now which is another favourite among the blogosphere. ♥ MAC Frost Eyeshadow in Naked Lunch. Surprise, surprise, another neutral eyeshadow. Naked lunch is a warm peach-beige with a frost finish. It looks great by itself when you want a little more on your eyes than just liner and mascara. It also looks gorgeous with shimmery neutral colours like Woodwinked, A Natural Flirt or All That Glitters. I can see why this is such a popular shade from Mac's Neutral selection. ♥ Bobbi Brown Corrector in Porcelain Bisque. This was in my favourites post last month and has been a staple in my makeup bag again during March. My sleep patterns have been out of sync and this corrector has worked a dream at hiding my dark circles. It's love.